Following the release of watchOS 3.1.1 yesterday afternoon, a few early-installers of the latest operating system for the Apple Watch have found that their devices become bricked during the update process. 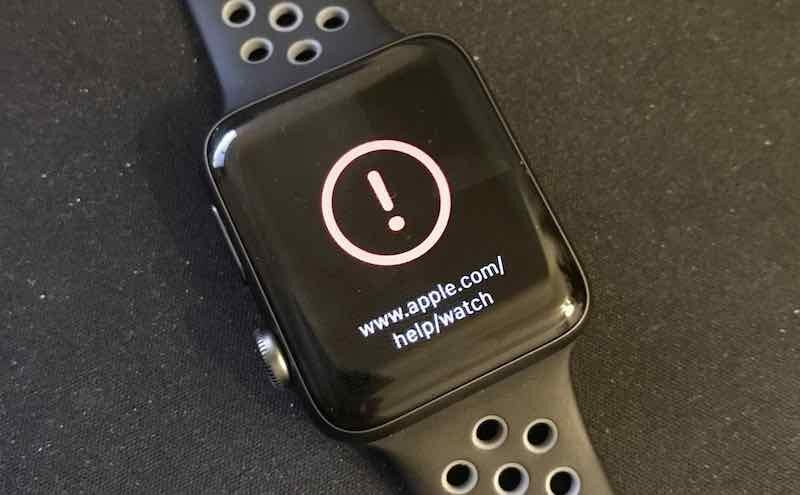 Users in the MacRumors forums, email tipsters, and quite a few Redditors have begun reporting a red exclamation mark on their Apple Watch's screen that guides them to www.apple.com/help/watch. Most have discovered they now need to send the device back to Apple so it can be replaced because Apple retail locations can't service the problem in-store. To fix the issue, the Apple Watch has to be restored through the device's small diagnostic port, which Apple Stores don't cover. The majority of users appear to be using an Apple Watch Series 2, and issues first began with reports of the watchOS 3.1.1 update getting stuck on the circular progress bar. A few bricking cases appear to be because some users were force-restarting the Apple Watch during the update process because of the progress bar being stuck in one place for upwards of a few hours. However, most cases appear to lack a specific reason as to why the Apple Watch bricked during the update, with those users reporting not having touched or interacted with the device while it was charging and updating. Now, users affected by bricked Apple Watches can either visit an Apple Store so the location can ship off the device to be replaced by a new Apple Watch, or they can visit Apple's support site to begin the exchange process and ship it off themselves. The Series 0 and Series 1 Apple Watches appear to have gotten through the watchOS 3.1.1 update with less of a hassle, although some admitted the update did "take a long time" and needed to be installed twice in one case. Apple has yet to address the watchOS 3.1.1 bricking issue, but it should be noted that there are also plenty of Series 2 owners who have made it out the other side of the update without any problems. Still, if you're concerned about a potential bricked Apple Watch, it appears that the best course of action is to stay on a version of watchOS of 3.1 or below for the time being. Yesterday, Apple also released iOS 10.2 and tvOS 10.1, both introducing the all-new TV app to users. Microsoft releases innovative hardware for professionals and Apple releases software updates that brick hardware. I do not like living in this alternate universe. Duh. I mean it's standard now for some Apple update to brick some device. I don't update on Day One anymore, especially for nothing more than an Emoji. I just wonder what non-tech people think when their device is bricked. I mean I know a lot of people that would totally freak out. This isn't the way to build or sustain Apple's brand. There isn't even the excuse that it was an old device since it's the current flagship AW. The bad thing about the watch is that there is no user-accessible recovery option. If the install has any problems and you're greeted with the "! ", the watch has to go back to Apple. They will have to find a better solution in the months ahead. They need to be able to at lease flash them in the store. Please send it back via airlines so we can send you a replacement - updated failed. Apple updates Car OS with new Car Crash Emojis. Your car needs an iPhone 9 to install the update. To unlock your car you need the latest Apple Watch Series 4 Ceramic only. The new Apple Car has only USB C connectors and a TouchBar instead of a steering wheel.